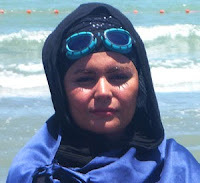 Female Iranian long distance swimmer, Elham Al-Sadat Asghari, or Elham Asghari for short, swam 18 kilometres in sea waters under 9 hours, in doing so she set a new record for women's open water swimming; but the Islamic Republic authorities have refused to register her record. The reason given by the Islamic Republic authorities for their refusal to register Elham's record is said to be because there is no officially sanctioned female swimwear for such an event. Elham however states that she was wearing the 'proper clothes' which included, the swim suit, cover, cap, goggles and head dress and she swam from the women's beach where no men apart from her father were present. Yet the authorities are still concerned that her "curvatures" may have been visible and are therefore uncomfortable to give her the recognition she deserves. Elham has been told to change her sport to something more "appropriate" for women. The extra attire that Elham has to put on to conceal her "curvatures" when she swims, weigh an extra 6 kg and are a burden to her swimming. "No where else in the world, would female swimmers put up with having to swim in these silly clothes. Imagine if Rezazadeh [Iran's former weightlifting champion] was told he had to cover himself up like this?" The news of why her swimming record was not being recognised, quickly spread through the Iranian cyberspace, and was even covered in some official Islamic Republic websites like Fararu, Tehran Mayor and presidential candidate's news website. Elham Asghari then released this video below and thanked all who publicised her case. Elham asked the Iranian women "not to give in to bullying, because swimming is not just for women"